The craftsmanship and precision of the Thompson submachine gun has an unparalleled history. The pump action Shotgun is a close range weapon that sprays a wide burst of Buckshot (small pellets). It is devastating at close range and can hold 6 shells before reloading is needed. In 1899 Smith & Wesson developed the first .38 cal Revolvers. The 442 was a direct decendant of the early weapons of this era. Weight: 4.0" - 42.0 oz. 6.5" - 45.0 oz. Introduced as the .38 Hand Ejector in 1899, the S&W� Military & Police line has been the choice of more law enforcement agencies and military units than any other revolver. 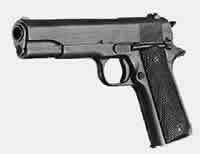 Widely respected for its reliability and lethality but required its user to be well trained to make best use of its single action operation, in one form or another remained standard issue in US army for 88 years.